Prototype: German Federal Railroad DB class 94 tank locomotive, type Rlmms stake car, type Gms 30 boxcar, type Kmmks 51 sliding roof freight car, type Om 12 high side gondola, all painted and lettered for the German Federal Railroad DB, and a four axle tank car with a brakeman platform, privately owned by Eva, Eisenbahn Verkehrsmittel Aktiengesellschaft Railroad Transport Company, Dusseldorf, Germany. Model: The locomotive has an mfx digital decoder and extensive sound functions. It also has controlled high-efficiency propulsion with a flywheel, mounted in the boiler. 5 axles powered. Traction tires. The locomotive is constructed mostly of metal. A 72270 smoke unit can be installed in the locomotive. The triple headlights change over with the direction of travel. They and the smoke unit that can be installed in the locomotive will work in conventional operation and can be controlled digitally. Maintenance-free warm white LEDs are used for the lighting. Piston rod protection tubes and brake hoses are included. The cars have close couplers with guide mechanisms. Train length 77.6 cm / 30-9/16". Contents: 14 no. 24130 curved track, 9 no. 24188 straight track, 11 no. 24172 straight track, 1 no. 24224 curved track, 1 no. 24612 right turnout, 1 no. 24671 left curved turnout, 1 no. 24672 right curved turnout, and 1 no. 24977 track bumper. Track connector box, 36 VA /110 volts switched mode power pack and a Mobile Station. An illustrated instruction manual with many tips and ideas is included. This set can be expanded with the C Track extension sets and with the entire C Track program. 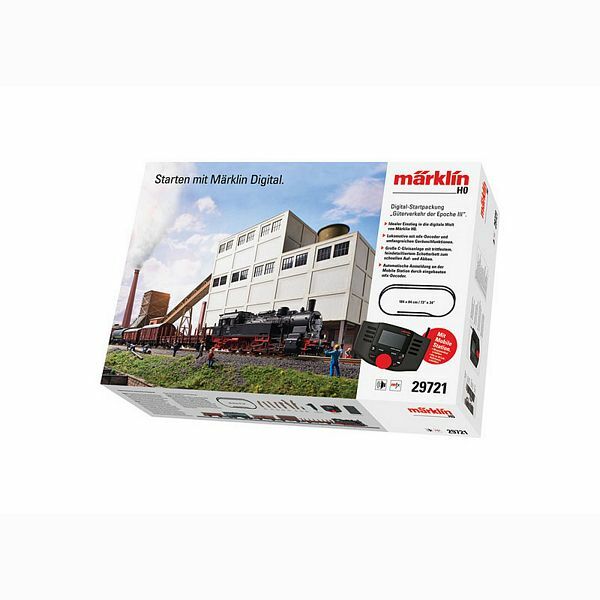 The ideal start in the digital world of Marklin H0. Automatic registration at the Mobile Station with the built-in mfx decoder.